Unlike Leonetto Cappiello and A.M. Cassandre who were what we would think of today as graphic designers, or artists who worked specifically in the realm of advertising, Roger Broders was an artist, who dabbled in advertising. Broders worked in Paris with a number of advertising houses, but his best client was always Chemin de Fer Paris Lyon Mediteranee, the Paris-Lyon-Mediterreanean Railway Company. The PLM serviced southern France, which included the Cote d’Azur as well as the French Alps. One could argue that Broders had the most beautiful subjects in all of France and there can be no doubt that he captured it like no other. Prior to 1938, France was home to six railway companies, with each providing service from Paris to a distinct part of the country. 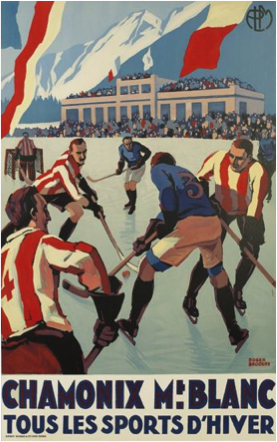 From the posters that survive that period, and there are hundreds, it is easy to see the competition between these companies for new and repeat clientele. Broders had some of the most beautiful landscapes in all of France to work with, but it would be his simple and beautiful art deco depiction of people wearing the most modern styles (for the time of course) that would be perhaps his most lasting legacy. PLM first commissioned Broders in 1922 and his early works reflect the style of the time. Avignon, while a stunning image is not so different from the art of others. In the following years he developed his own unique style from his visits to Menton, Cannes and other Riviera locations. 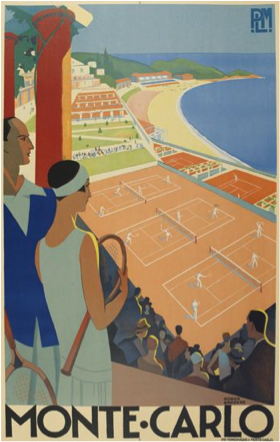 These posters featured beautiful people, in simple but stylish clothes enjoying the tropical environs of southern France. Later when he focused on Alpine regions he captured winter sports in a unique style that both highlighted the sporting event while at the same time emphasizing the natural surroundings. Broders painted one hundred posters in his career and most retain impressive values today. His best designs for PLM can reach in excess of $10,000. Monte Carlo, below, sold for $15,000 at auction in December 2011.